Today, under cover of darkness, China successfully launched their first robotic lunar rover atop a powerful Long March-3B rocket from the country’s Xichang Satellite Launch Center in southwest China. The mission, which is named after the Chinese goddess of the moon in ancient myth, would make China the third country (after the United States and Soviet Union) to land on the moon. The last lunar landing was performed by the Soviet Union on the Luna 24 sample return mission in 1976, and the United States remains the only country to have ever landed humans on the lunar surface (last human mission to the moon was NASA’s Apollo 17 in Dec. 1972). The launch countdown appeared to have gone as smoothly as possible, and mother nature provided ideal conditions for a 12:30 p.m. EST (1:30 a.m. Monday local time) launch attempt. The launch itself also appeared to have gone as expected, and within minutes after liftoff the Chang’e 3 lunar lander and its six-wheeled rover, named Yutu, or “Jade Rabbit”, successfully separated from the rocket’s third stage as it coasted into a beautiful sunrise roughly 300 kilometers over the Pacific Ocean. 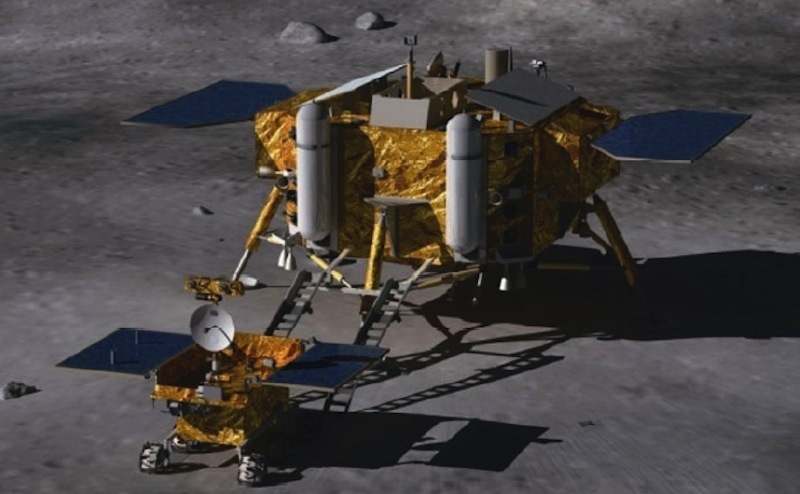 An artist’s concept of the Chang’e 3 lunar lander and its smaller Yutu rover, also named “Jade Rabbit”, on the surface of the moon (Credits: Beijing Institute of Spacecraft System Engineering). In ancient Chinese mythology Yutu was the white pet rabbit of Chang’e, and lived on the moon with the lunar goddess. The name for the rover was selected following an online poll that collected over 3 million votes from people around the world. The 260 pound rover, which was designed by the Shanghai Aerospace Systems Engineering Research Institute, will take four to five days to reach the moon, and will orbit for several more days before making its landing attempt in a flat volcanic plain known as Sinus Iridum, or the “Bay of Rainbows”. A variable thrust engine will help Chang’e 3 perform six stages of deceleration as it descends from 15 kilometers above the surface, and 28 thrusters will control the spacecraft’s attitude through the descent. The European Space Agency (ESA) expects the lunar landing to occur on Dec. 14, as the agency is providing mission tracking of the Chang’e 3 lander and Yutu rover for China’s space agency. Yutu is designed based on the topography of the lunar surface at its landing site, and although the mission team selected the landing site the Chang’e 3 lander has the ability to perform the landing autonomously – it can choose the final landing site itself using radar to aim for a level surface so deployment of the rover is safely conducted. The rover itself is equipped with specially designed metallic wheels so the dusty lunar surface will not negatively affect the the vehicle. Once on the ground the rover will rely on onboard sensors and three cameras to navigate its own way to avoid obstacles, mapping its own path around rocks and other dangers that could cripple the vehicle, therefore eliminating the need to climb steep slopes to reach areas of interest (the rover can however climb slopes that angle to as much as 30 degrees). 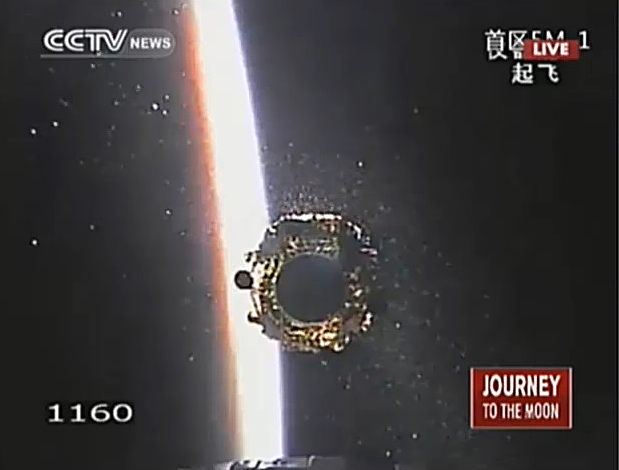 Successful seperation of Chang’e 3 and China’s Yutu lunar rover from the Long March-3B rocket’s third stage as the sun rises over the Pacific Ocean minutes after launch (Credits: CCTV). Yutu is tasked with the goal of surveying the geology of the moon, both on and below the surface, as well as seeking out natural resources which could (potentially) be exploited to our benefit in the future. It has been known for some time now that the moon is rich in minerals and metals such as uranium and titanium, which Earth does not have much of for us to use. Helium-3 is also available in abundance on the moon, and could potentially be used as a possible fuel for nuclear fusion, which (in theory) could eliminate our demand for energy for thousands of years. China intends on launching another unmanned rover to carry out a similar mission in 2015 before launching a lunar sample-return mission in 2017. Should both of those missions (Chang’e 4 and Chang’e 5) be successful then China will be ready to send humans back to the moon in the mid to late 2020′s.